Labelling GMOs, Yay or Nay? It’s our right to know, right? For years, the anti-GMOs crowd has always stated that it’s their right (let alone what a right ACTUALLY means) to know what’s IN their food and have requested mandatory federal labelling on GM products. It has become mainstream and has reached many people, even some people who are pro-GMOs may support labelling. The labeling question is a wide and diverse topic, with many opinions involved. It is therefore a very difficult question to tackle objectively. Before we start, we must remember what things are put in a label. The first thing that pops to mind here is allergens. Allergens can and do present a serious threat to allergic people, and they must know what’s in their food to avoid any potential fatal reactions. Ingredients and nutritional information are also available on every food label. Nutritional information is there to provide a more guided approach to healthy eating and make sure everything is eaten in moderation. Ingredients are there so as not to cloud the food in a ‘mystery’ and make the operation more controlled. Other things that are sometimes included in the label are country of origin and of course, expiration and production. Different things might be there, but that depends on the food and the producer as well as the country. The arguments pro-labelling practically follow similar paths and are relatively similar to the ones presented above. The anti-labelling side has more arguments in this regard. The first argument here is that labelling GMOs is useless and futile, as GMOs have been ‘proven safe’. This argument extends to arguments about safety so it’s a bit of a complex one. 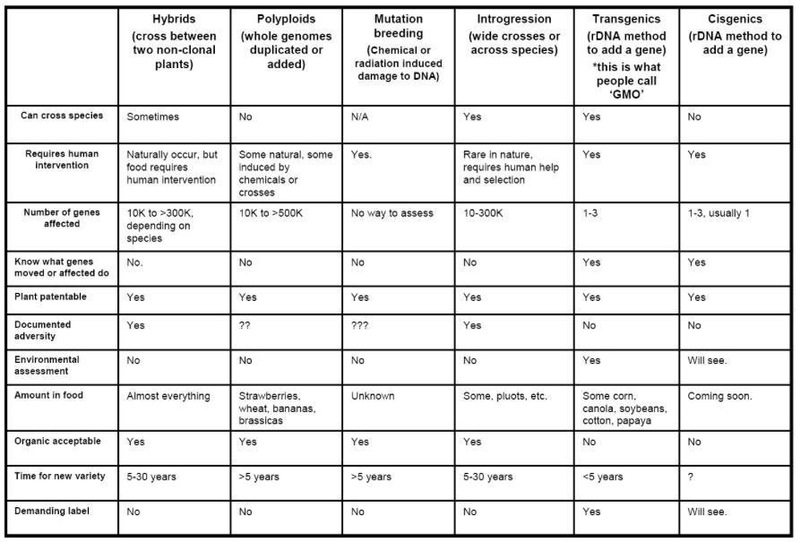 Another argument is that labelling GMOs would demonize them. This is something of a counter-argument to the ‘if they’re so good, why not label them?’ argument. This argument points out that only harmful things would be clearly and mandatorily labelled, like allergens. And there’s the argument about the cost and time it would take to label things considered GE and not. This also raises the question on what to even carry such label – do animals fed with GMOs require their meat or milk to be labeled too? What about different types of GM? Finally, many people have raised the fact that things that don’t have GMOs are almost always labelled. Either as “organic” or through the Non-GMO Project or other 3rd party labelling groups. This gives those avoiding GMOs a wide range of labelled food that doesn’t contain GMOs. The first argument, regarding ‘our right to know’, is one that is echoed a lot. But claiming that it is our right know raises some questions. Is it, for example, my right to know the religion of the farmer? Such information would be useless, as GMOs have been proven safe. Avoiding GMOs for any other reason is just silly and naïve. GMOs are found in practically everything, should we label every food? What about the quantity? Should we label animals who have eaten GMOs? The questions raised due to the ambiguity are far too many and overwhelming to address here, but you get the point. One must also remember that USDA organic allows 5% of the product to be GM, and that certainly affects the labelling question. 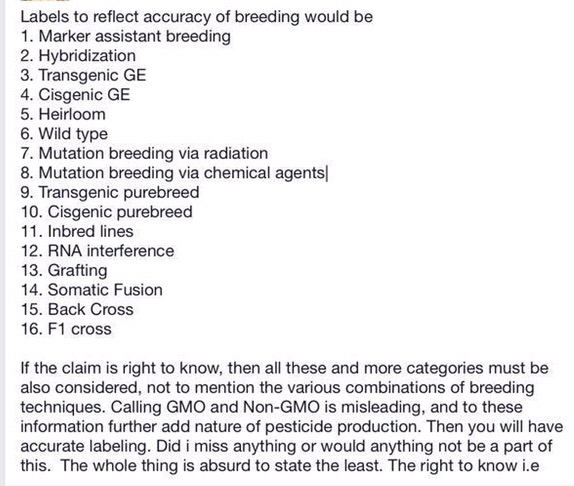 The second argument here is one that is directly against, “If GMOs are good, why label them?”. The argument goes, that if GMOs are so good, why not voluntarily label them, like the sought-after organic or “natural” labels (however shady they may be). In this case, @guidoV4 (go follow him, he tweets about GMOs and biotech too. He also has a ton of hashtags in his bio) points out that “natural” or organic labels are voluntary, and any company can practically put the label “natural” on their food. Mandatory labelling, like the one that activists seek, is put there to warn of danger, as in allergens or nutritional content. It wouldn’t be mandatory otherwise. @TkThtEtymology suggests labelling them in a way presents them as good. Good idea, but does it stand? 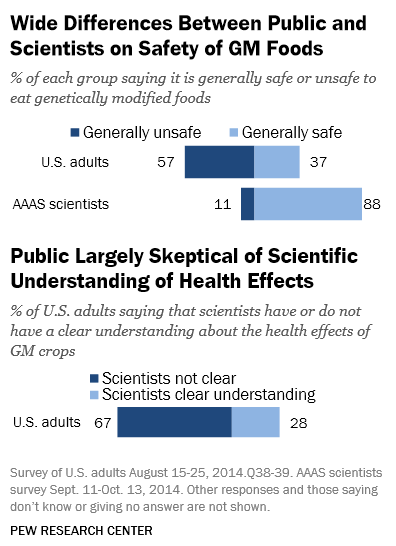 The public also heavily misunderstands GMOs. In a Pew survey, the gap between scientists and the public was the highest when it came to GMOs. This clearly shows that labelling, wether intended to promote or to warn of GMOs, will have the same effect. It will demonize GMOs and scare the public. And that may kill a technology so youthful with so much potential. The cost of labelling is a big chunk of the debate. The cost doesn’t just rest on printing and gluing, but also on segregating the foods, testing, certifying and many, many other things. Jane Palmer has a good article on this. The well-researched article concludes that mandatory labelling can cost 100s of millions of dollars, severely increasing prices both on the customer, the company, the farmer, the State and the food producer. First of all, higher prices would decrease customer demand. Foods containing GMOs are found everywhere. About 60% of the market contains some form of GMOs. The price of labelling would also turn companies away from GE, further increasing the oligopoly. Food making companies would also turn away from GMOs due to increased costs, therefore labelling would signal the end for GMOs. If labelling is about our ‘right’, why stop at GMOs, one of the safest and most controlled biotechnologies. Why not the arguably more dangerous mutagensis? Or the tons of other breeding methods? How does knowing the breeding methods help you lead a healthy life, since all are very safe and very effective? 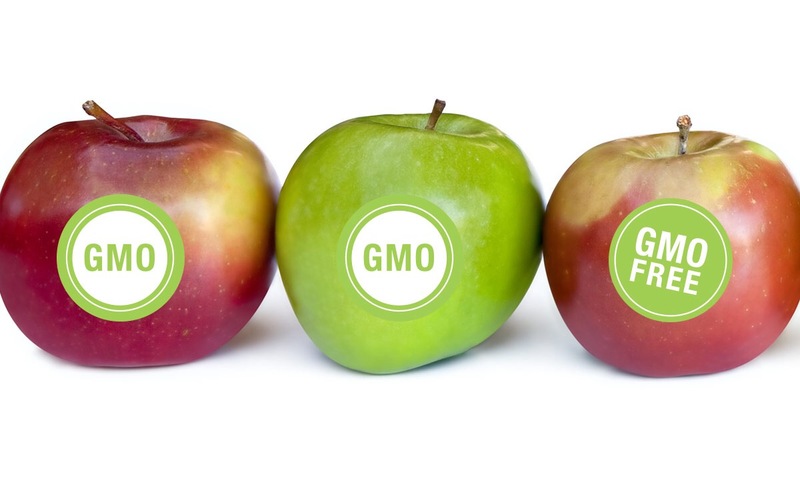 Labelling is, and will remain, one of the biggest issues when it comes to GMOs. Both sides are extremely passionate about their opinion and go long distances to support their point. This article here provided an analysis of and gave an extra voice to the labelling debate. At the end of the day, labelling GMOs in the US is a far fetched goal, one that may never happen. Research into labelling (some going to the government) has shown that it’s expensive and does nothing but put a huge burden on GMOs, where the burdens are already too heavy. Keep in mind also resolution HR1599, or hilariously dubbed the ‘DARK’ Act may just prevent that. Labelling might be far-fetched, but always remains a possibility. This time, however, the extra weight may just cut off the life monitor. Is labelling worth it? Next Article On engaging with the specimens, or the laws of interaction.